The Khilji Dynasty was the second dynasty ruling the Delhi Sultanate of India. The Muslim dynasty led by Jalal-ud-din Firuz Khilji, the founder, ruled over large parts of the subcontinent from 1290 to 1316 AD. Alauddin Khilji was one of the most successful rulers of the Khilji Dynasty as soon as he succeeded his father’s throne. Here, we have highlighted the important historical monuments built during the Khilji Dynasty. If you are a history buff, we have monumental treasure in store for you! During the era of afghan rulers of Khilji Dynasty, Islamic architecture was taken to an all new level after the rulers of Slave Dynasty. Alauddin’s reign marked a great phase in the historical pages of medieval architect. He was a great architect and ambitious builder. His designs were his works of improvement upon the previous Sultans. NO one could ever create a historical monument as magnificent as the ones created by Alauddin Khilji. Let us talk about the top historical monuments depicting the architecture of Khilji Dynasty. Alai Darwaza, built in the year 1311 by Alauddin Khilji is a perfect example of the impeccable architectural style of the Delhi Sultanate period. It is a section of Quwwat-ul-Islam mosque extended by Alauddin. It was one out of the four grand gateways proposed by the ruler. However, the remaining three could be completed due to Alauddin Khilji’s death in 1316 AD. The main structure of the monument includes a single hall 56.5feet on the exterior and 34.5feet on the interior. The domed ceiling of Alai Darwaza is 47feet high. All the three doorways on the west, south and east have horse-show shaped, lofty pointed arches rising above the skirting side bays. To the contrary, the northern doorway has an arch semi-circular in shape. You will be mesmerized by the view of this magnificent Alai Darwaza at the very first sight. How to Reach: Book your cheap flight tickets to Delhi International Airport to witness the wonders of Khilji architecture. To have a glance at the majestic Aai Darwaza, you have to reach the Qutab Minar Complex. Take the metro, a local bus or cab from the hotel. If you are planning to utilize the upcoming holidays, cheap last minute flights are also available at Indian Eagle. The Jamait Khana Masjid is the oldest mosque in Delhi that is still used by the Muslims for worship. Located in the Nizam-ud-din Auliya Complex, it is the largest structure of the Nizammudin Basti Dargah. It was constructed in 1315-1325Ad by Khizr Khan, successor of Sultan Allaudin Khilji. The Mosque has three bays, each of which is sheltered by a domed roof with the center dome being the largest and it is the one in practice. There are marble finials adorned all over the top of the domes. You will find the entrance archway and central bay decked up with Quranic inscriptions and bands of geometric motifs. How to Reach: Get your flights to Delhi booked and visit this religious site to understand the depth of Khilji architecture. Siri Fort is the second of the seven cities of Delhi built in 1303 by Ala-ud-din Khilji. Though now in ruins, this was the seat of power of the Afghan rulers during their reign and the only country that could never be conquered by any ruler of the Delhi Sultanate. What gave result to this magnificent fort was the Sultan’s desire to protect his subjects from the Mongol invaders attacking India. Records say that it was after defeating Mongols that Khilji laid the foundations of Siri over the decapitated heads of almost 8000 Mongolians. Again, it is the same fact that lies behind its name “Siri’ – from “Sir’, a Hindi word meaning head. Yes, we know it sounds a little gory but there are some other facts that are way more appealing. The architecture of Siri Fort was proposed and designed by the Salijuq artists. Constructed on an oval plan, the city had seven gates but only the South-eastern gate is operational now. The thickness of the walls still erect is evident of the efforts of over 70,000 craftsmen involved in creation of the city. It is believed that it is one of the reasons behind the failures of several conquerors to vanquish the city. You must be wondering what brought down the ever magnificent city to ruins, right? Well, there was no war, no invasions, but the actions of other Delhi rulers like Sher Shah Suri. Sher Shah Suri looted the Siri fort to use it as a source of building materials for the new cities to be built under his rule. You can still find some of the Siri stones in Purana Qila and Sher Shah. 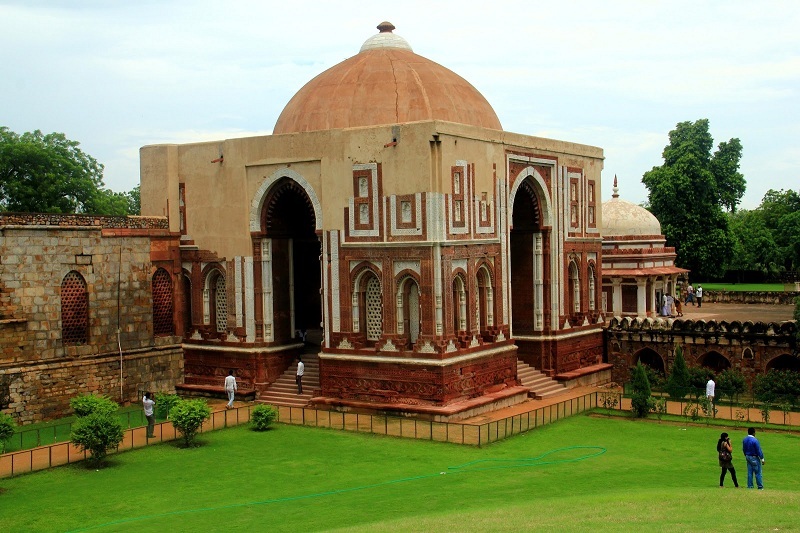 How to Reach: Get your flights to Delhi booked and visit this archaeological site to understand the depth of Khilji architecture. In case you booked business class flights to attend a conference in Delhi, visiting Siri Fort will make your trip beneficial in all ways.